Current Urgent Need: Prison Visitors! Since word is getting out about our Sophia’s House project, we are already getting requests to visit women who are incarcerated. We need teams of two to commit to visiting at the Correctional Center in Windham or local Androscoggin County Jail monthly, and writing between visits. If interested, please contact the Center 513-3922! Thanks! General Ongoing Opportunities: All of our programs are led by volunteers and offered free of charge so we gratefully receive various in-kind contributions of time that support our programming as well as office needs. If you have a skill or interest to share, let us know. We ask that people who will be regular volunteers, to first come hang out a couple of times before volunteering. Some volunteers come weekly, others monthly. Regular programs each morning and afternoon include art, poetry, writing, knitting/crocheting, painting, crafts, health and wellness topics. Other volunteers help in the kitchen and lead cooking sessions and some are hospitality volunteers who staff the front desk. We also have people help with fund/friend/awareness-raising events. 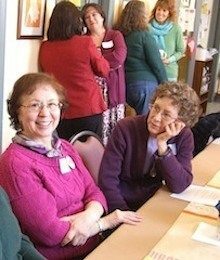 Our core volunteers are called “Companions.” They are the non-anxious, non-judgmental listening presence at the Center. Each Companion gives at least one full day per week (the same day each week) and one or two Companions are on site during all open hours. They nurture community, become a trusted presence are there to offer a listening ear, and generally hold the space and tend the spirit of the women who come to us. They meet monthly with a local LCSW who donates her time for supervision. Companions are a highly dedicated team. Each of them has a professional background in a field such as social work, chaplaincy, nursing or teaching. This is a unique aspect of our work that sets us apart from other service agencies. We also partner with area agencies that provide classes such as: The Nutrition Center of Maine, Health Affiliates Maine, Cassiel’s Salon and Day Spa, The Art Van, and Dempsey Center. Two local social workers lead workshops about adverse childhood experiences (ACEs) and how to build resiliency. We also often host student volunteers from Bates College and interns from USM’s nursing and counseling programs. If you would like to offer a program or otherwise volunteer, please contact the Volunteer and Program Coordinator, Sonia Turgeon.